History – Firelands Rails to Trails, Inc. Welcome to the original Transcontinental Railroad between New York and Chicago! The Toledo, Norwalk and Cleveland Railroad was chartered in 1850 as a route to connect Toledo, Norwalk & Grafton and serve the rich agricultural regions of Northern Ohio. 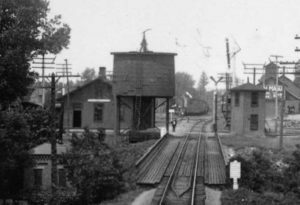 The railroad was opened in January of 1853, and in September of 1853 merged with the Junction Railroad to become the Cleveland & Toledo Railroad. In 1866 the C&T built a more direct connection from Oberlin to Elyria to join their Northern Division, and after a merger in 1869 the line through Norwalk became the east-west main line of the new Lake Shore and Michigan Southern Railroad, which constructed the beautiful double arch bridges over the Huron and Vermilion Rivers in the early 1870’s. 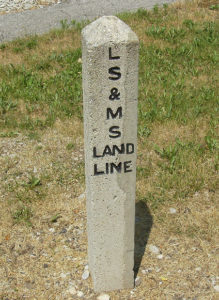 In 1914 the LS&MS was absorbed by the New York Central System, which in 1919 closed the Norwalk Locomotive Shops and reduced the Norwalk line to secondary branch status, with the current line through Sandusky becoming the main line. The “Norwalk Branch” became part of Penn Central in 1968, and in 1973 experienced a major washout at “The Big Dip” in Norwalk, dividing the line into two sections. The line was abandoned in 1976 upon the creation of Conrail, and over the next 25 years nature reclaimed the corridor. In the late 1990’s the Northwest Ohio Rail Trail Association and a consortium of Park Districts purchased the former rail corridor, so that it could be developed as the North Coast Inland Trail between Toledo and Lorain. Firelands Rails to Trails, Inc. was formed in 2000 to build and manage Huron County’s portion of the NCIT, while preserving the rich history of the Norwalk Branch.